YOUR API EXPERTS: The highest quality, specialized knowledge, and transparency: this is what we bring to active pharmaceutical ingredients.We are your specialists with clearly-defined schedules, extensive high-quality Swiss services, and a global network built up over decades. We focus on a few select therapeutic groups and set the right priorities.Because we’re quality-conscious. 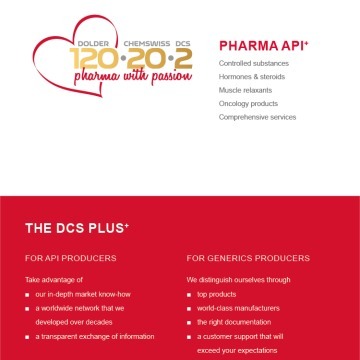 Your message will be sent directly to DCS Pharma USA and will be answered at their discretion.